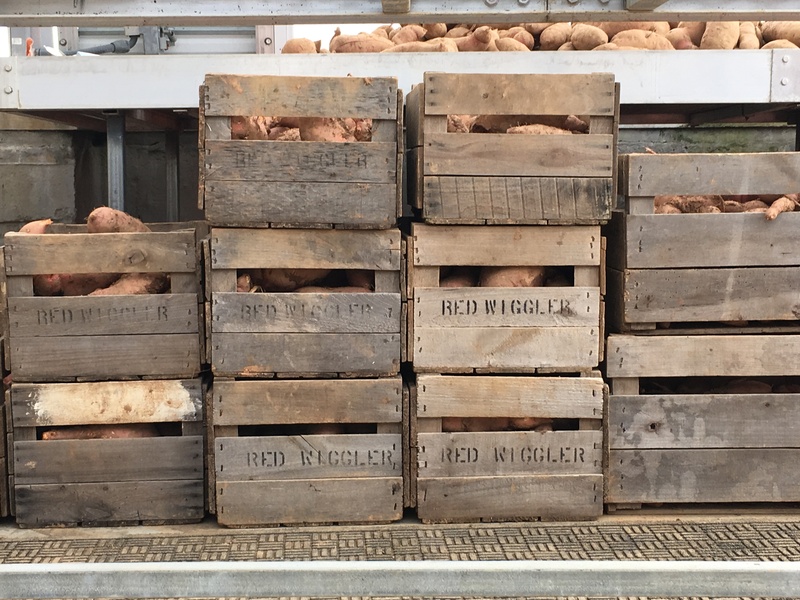 After many weeks patiently waiting for dry weather, we have finally finished our sweet potato harvest. The potatoes were planted from slips on June 15. Slips are green leafy shoots that grow out of an already harvested sweet potato. The slips are planted into hills about a foot apart, then turn into vines that spread to wherever they can find bare soil. Sweet potatoes are ready for picking after the plant has flowered. After the flowers disappeared, it was all about waiting for a dry enough series of days to harvest. 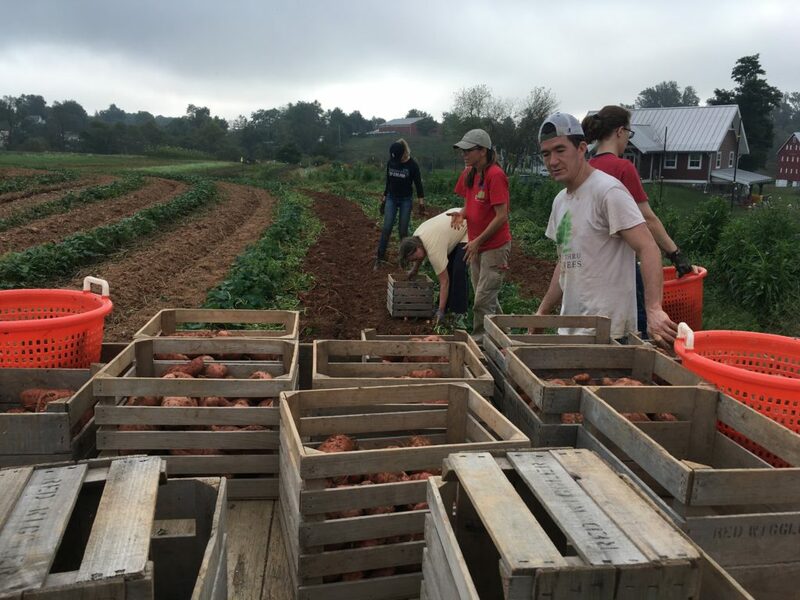 It takes a full team to harvest 400+ pounds of sweet potatoes in a morning. And it takes several days to harvest the whole field. First, a path must be made for the tractor. Clippers in hand, everyone starts cutting and removing the vines. Next, Co-farm Manager Melissa passes thru the field on the tractor with a tool that digs underneath the potatoes, turning them up on top of the soil. Then comes the picking. It's all hands on deck to pick potatoes, sift thru mounds of earth, fill the crates, and carry them all to the wagon. 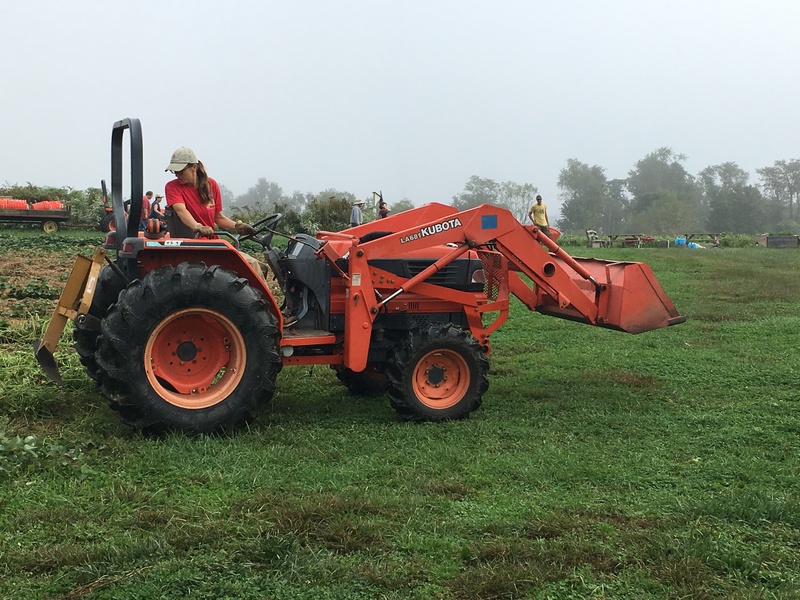 The tractor and the team will pass through the same rows a few more times before the field is considered complete. 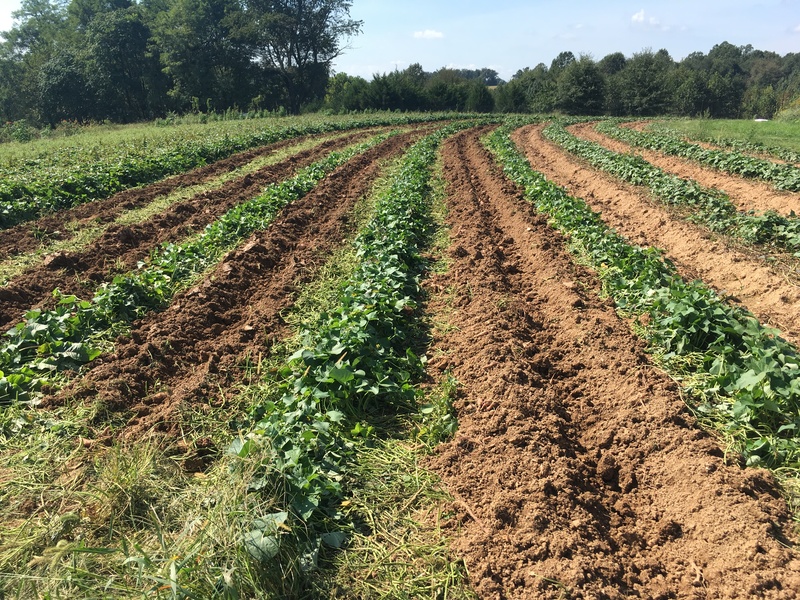 With so many pounds potatoes coming out of the field not all will be in pristine condition. 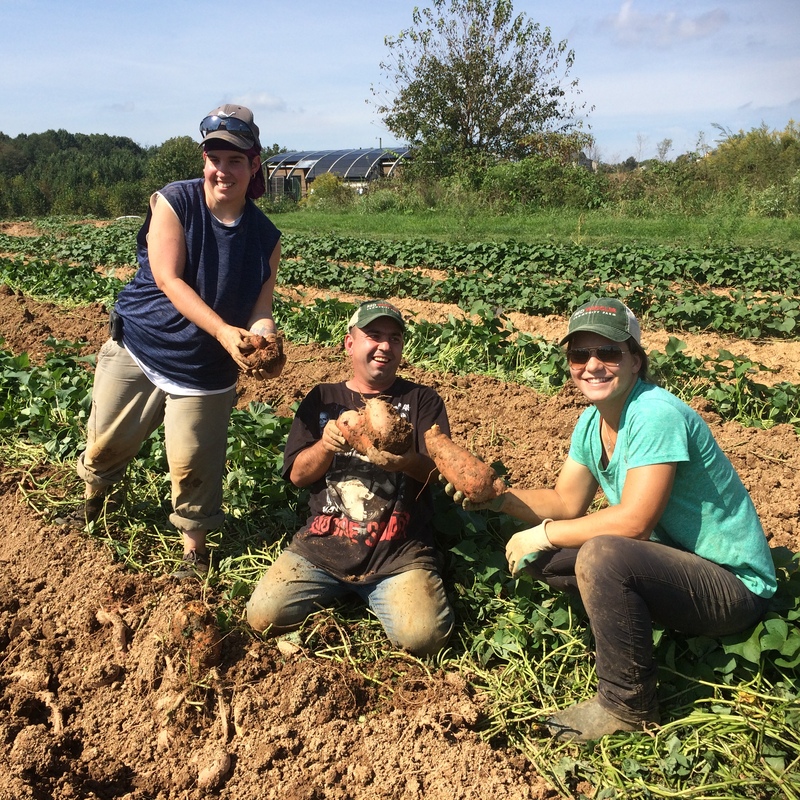 Potatoes damaged by bugs, voles, tools, or rough handling, won't keep as long as the intact ones. However, they are still high quality, delicious food. 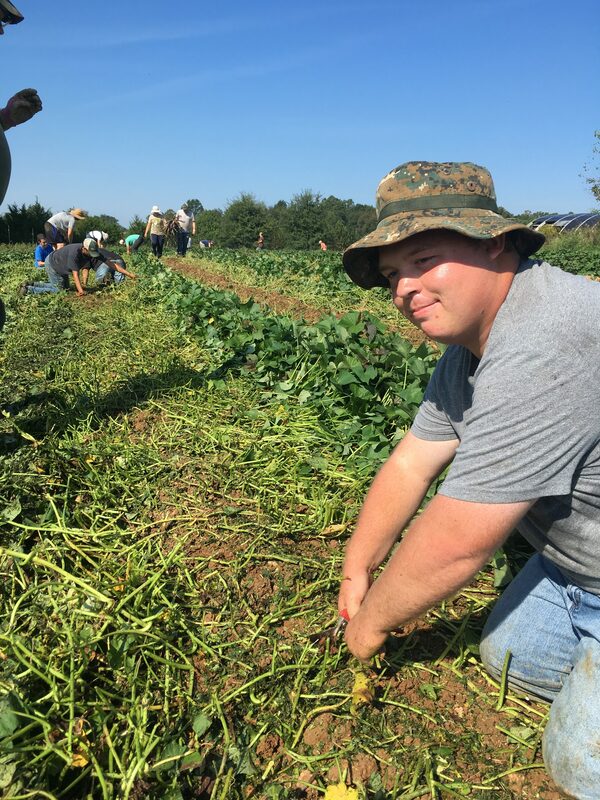 Partnerships are essential to helping Red Wiggler maintain its commitment to sustainability and reducing food waste. So far over 300 pounds of sweet potatoes have been given to DC Central Kitchen and Community Food Rescue. 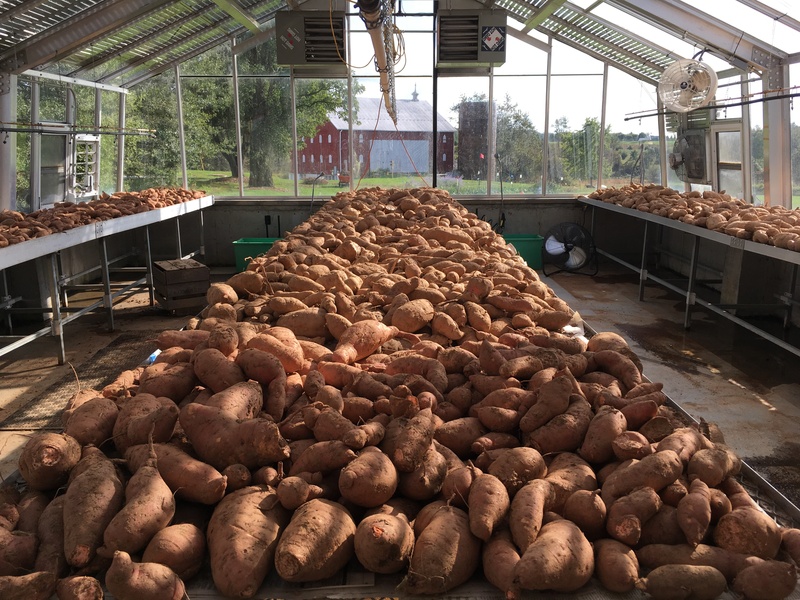 These local agencies are able to process huge amounts of potatoes right away and distribute them to other organizations and individuals in need. What would have been food waste becomes meals for many families within the Montgomery County-DC area. Closed to seedlings for the season, the greenhouse becomes a curing house. There's one more step in between the field harvest and distribution. Curing is the process that allows the sugars to further develop in the sweet potatoes, and for the skins to toughen. 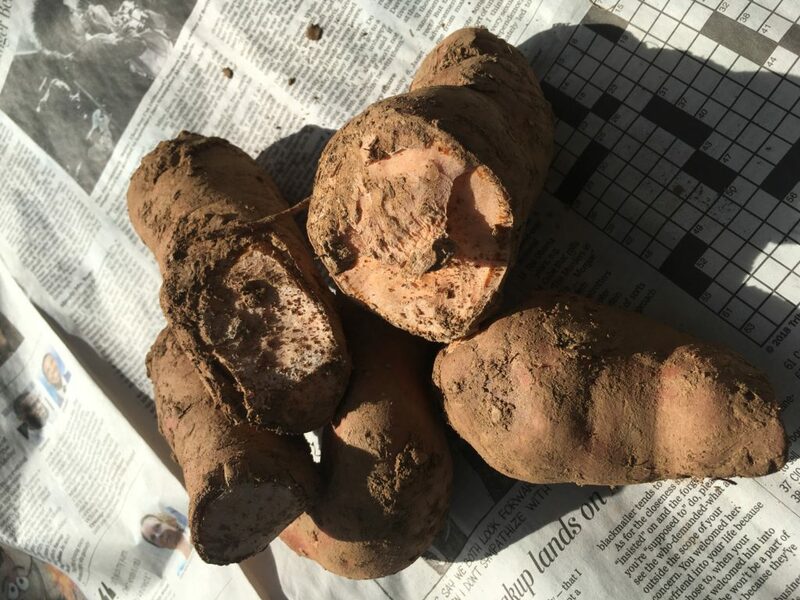 A fresh sweet potato has a thin skin delicate enough to be taken off with a fingernail. After curing the potatoes will be storage ready able to keep in a root cellar for months. What does one do with all these sweet potatoes? Boil'em, mash 'em, or bake 'em in a pie. The real pleasure is enjoying the sights, sounds, and tastes of fall; and all the team building that happens in the process.